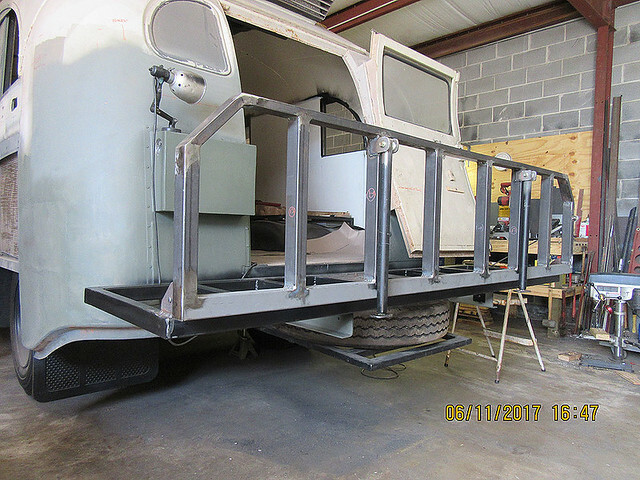 Need help with a rear deck that meets Safety Regulations (size: weight/width/length) that would support a 400cc dirt bike and storage to the Class 3 hitch with/ without frame support. What's the rear counterweight spec for a 4250 kg Dry weight Short Bus please. Much Thanks. I don't think anyone has had any of there stuff crash tested. I would recommend getting it rv converted and approved then add this later. Here's how I'd look at it - to store a few items and a small bike, you don't need a very big deck (only two or three feet long at most.) Make sure that the back of your deck has a pair of lights on it so people can see where your bus ends in the dark (and that it sticks out further then the factory tail lights.) A cheap set of trailer lights should do the trick. I woldn't worry about the size being too big - I think you'll hit the weight limit of the hitch first. You're not towing a trailer, so we're interested in the tongue weight rating - it doesn't sound like you've got weight distribution hardware, so I'd say the weight limit of your hitch is 600 LBS - so the deck, the bike, and any other cargo needs to weigh 600LBS or less. Thank you. 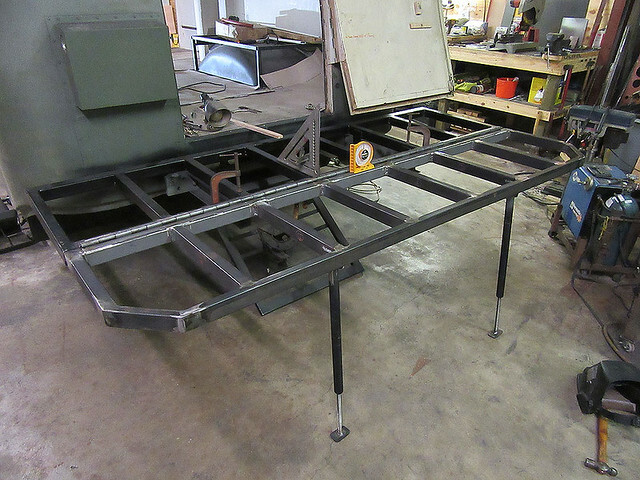 Fabricate a deck with a frame mounted arm(s) to bear the swing weight How much would that approx cost by a fabricator? A fold up deck is certainly doable. Mine extends 24" when up...and 48" when lowered. It is mostly 1" x 2" rectangular steel tube. Tail lights will be mounted underneath to be seen when in the up position for driving. Down for parked with adjustable stabilizers. Still need to lay the decking on but that's the easy part. Since I did all the fabrication, I only had the steel costs to deal with. Maybe $75 bucks? Tango is that deck hitch mounted only? No hitch on mine. Don't plan on doing any towing. But I did hang my spare tire under there. A hitch could easily be attached though. Just an extension from the frame rails needed. That's the coolest thing I've seen in some time. I'm wrestling with how to do a deck for parking a mini-split, generator, and 690 motorbike on. I like that your folding deck can serve as a dual purpose "cage" to help contain all the gear on the back deck while in transit.